Update, May 16: UE has launched an online campaign to get more senators and representatives to co-sponsor the Workplace Democracy Act, and a resource page that explains more about the Workplace Democracy Act and has tools to support it. 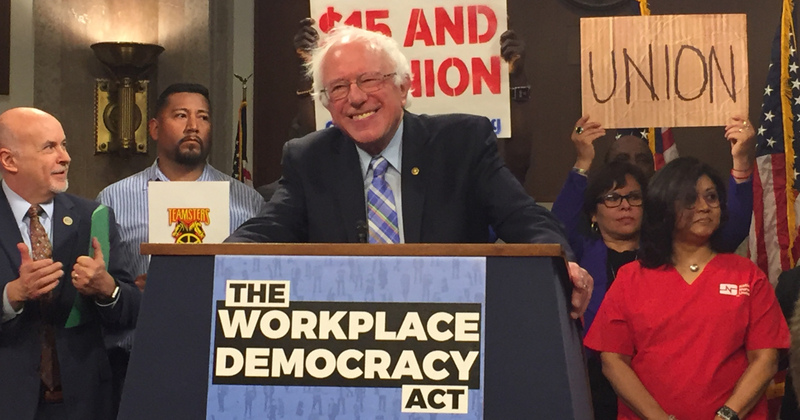 On Wednesday, May 9th, Senator Bernard Sanders (I-VT) introduced the Workplace Democracy Act, a bill that would restore workers’ rights to organize and bargain for better wages, benefits and working conditions. The Bill of Rights has never been applied in the workplace, where employers are empowered to maintain near-absolute control. With our constitutional rights shredded by our employers, our modern day rights to organize into unions are also ignored by bosses. Our freedom to be protected from unreasonable searches and seizures ends at the gate or front door. Our freedoms of speech and assembly are virtually nonexistent while at work — unless you have a union…. No significant progress has been made on the labor rights front in decades, and today employers brazenly violate the law and victimize working people who dare to challenge their complete control by attempting to unionize. Make it easier for workers to organize free from intimidation, by allowing them to organize a union through a majority sign up process. The bill would allow the National Labor Relations Board (NLRB) to certify a union if it receives the consent of the majority of eligible workers. Make it easier for workers to get a first contract and ensure that companies cannot prevent a union from forming by denying a first contract. Employers would be required to begin negotiating within 10 days of receiving a request from a newly formed union. If no agreement is reached after 90 days of negotiation, the parties can request to enter a compulsory mediation process. If no first contract is reached after 30 more days of mediation, the parties would have a contract settlement through binding arbitration. Eliminate free-riding by repealing Section 14(b) of the Taft Hartley Act, which has allowed 28 states to pass legislation eliminating the ability of unions to collect fair share fees from those who benefit from union contracts and activities, undermining the union’s representation of workers. Ensure employers can no longer avoid responsibility and prevent workers from organizing by designating certain workers independent contractors, supervisors, or through franchisee arrangements, by modernizing and expanding the definition of employer. Restore union members’ freedom of speech to take action to pressure clients and suppliers of companies opposing unions, including secondary boycotts and picketing. Curb the power of union busters. Companies would be required to disclose anti-union propoganda they disseminate to workers, including funding third party anti-union consultants, who would have to register and be law abiding. Employers will be also be prohibited from forcing workers to attend campaign activities that are unrelated to the employee’s job duties. Although the Workplace Democracy Act will be prevented from coming to the floor of this Congress by Newt Gingrich and his anti-labor majority, it is still important that we work to build support for this legislation. Our future as a union, and our future as a labor movement, depend on our ability to — sooner or later — win the kind of real labor law reform that this bill contains. We must educate our membership, our members of Congress, and others in the labor movement about the contents of this bill, and why it is so important for them to help publicize and support it. When someone asks us what labor needs in order to restore our right to organize and bargain, the answer is simple. Pass the Workplace Democracy Act. Any member of Congress who expects working people to support them should co-sponsor and support this bill instantly. A refusal to do so will speak for itself. Let’s get busy. The same holds true today. Stay tuned to ueunion.org or sign up for the UE ActionNet for online and offline tools to help build support for this important legislation.